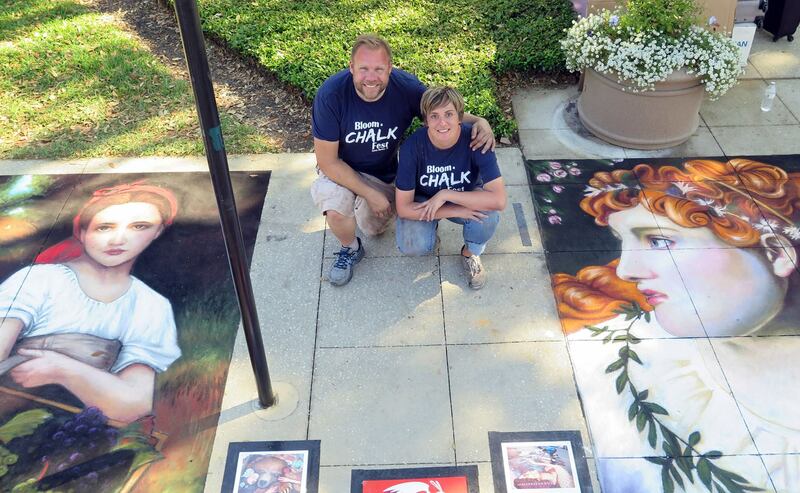 Shelley Brenner has been featured in a large number of street painting festivals both nationally and internationally. A lifelong artist in a variety of mediums, she now focuses much of her artistic attention on traditional and 3D street painting. Her work is often inspired by classic portraiture, interactions between humans an nature, and the unexpected. She loves the process of bringing a piece to life in large-scale within a public and accessible environment where artists and others can interact. As one half of the Pigment of Your Imagination team, she also enjoys collaborating with her husband, Dave, on large 3D designs for festivals and clients. Shelley began her higher education with a fine arts scholarship at Wayne State University in Detroit, MI. Today, in addition to street painting, she works as a Certified Registered Nurse Anesthetist in Ann Arbor, MI. Dave Brenner holds a BFA with a concentration in painting and a BA in theater from the University of Alaska – Fairbanks. He is now a Creative Director at the University of Michigan. Dave has a unique ability to transform creative ideas into stunning works of 3D street art. He is inspired by the prospect of bringing the impossible to life via the interactive nature of his 3D designs and often employs themes of fantasy or illusion. He is regularly featured in street painting festivals both within the U.S and internationally. Dave also enjoys collaborating with his wife on large-scale projects as part of their Pigment of Your Imagination team. BOOK A PIGMENT OF YOUR IMAGINATION FOR YOUR NEXT EVENT!